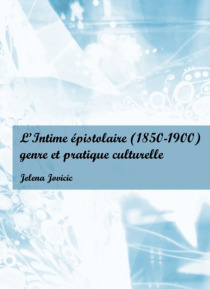 L'Intime epistolaire (1850-1900): genre et pratique culturelle is a study of private letters by eight Nineteenth-Century French authors-Flaubert, Zola, Sand, Baudelaire, Maupassant, Eberhardt, Bashkirtseff and Edmond de Goncourt-during the period of 1850 to 1900. Through in-depth analyses of these intriguing documents, the book demonstrates that personal correspondences cast fresh light on the con… cept of intimacy in Nineteenth-Century French culture. Since epistolary writing implies a necessary exchange between lived experience and the written word, the book's intention is also to interpret "e;letter practice"e; as a specific textual form, with its own generic expectations and constraints which are distinct from other life-writing genres such as the diary, the autobiography, and the memoir. Divided into five chapters, the study begins with a short introduction to the "e;culture of individuality. "e; The four subsequent chapters explore the poetics of epistolary writing, including significant topics, the various roles of the letter writer, epistolary pacts and the problem of the signature. Addressing a wide range of epistolary situations, including daily life, health, money problems, love, travel, and even suicide notes, the book also offers new critical perspectives on six of the most interesting manuscript letters that have been chosen from the examined sources.